Mt Tongariro – long considered a peaceful neighbour to the rowdy Ruapehu – is much more fiery than we ever realised, says a scientist sharing new findings today. GNS Science volcanologist Brad Scott, among scientists giving presentations in a workshop at Whakapapa Village, has found evidence of eruptions at Mt Tongariro that weren’t previously on the records. 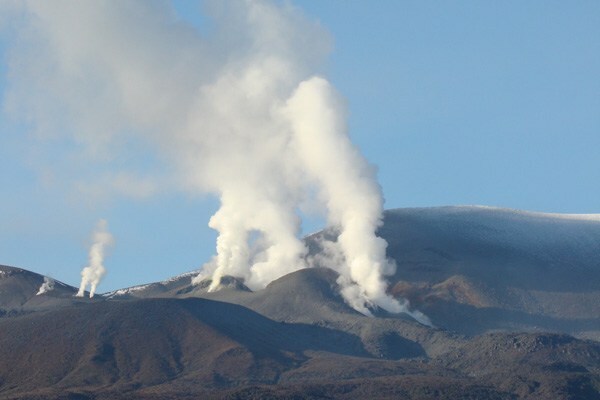 Tongariro’s dramatic eruptions in August and November of 2012 transformed our understanding of what had been considered a comparatively docile mountain, Mr Scott said. When ash shot from the Te Maari Crater 7km into the sky shortly before midnight on August 6, it was thought at the time to have been the first blow there since 1896. But Mr Scott has since found records indicating an eruption at the crater in 1928, with other events at Red Crater – a feature of the Tongariro Alpine Crossing – in 1909, 1926, 1927 and 1934. Further, there was volcanic unrest at the mountain right up until the 1970s, he said. Other research being presented would discuss findings around the ballistics of rocks that were ejected from the mountain in 2012, as well as the volcanic avalanches and debris flows that came with the eruption. Mr Scott saw the event as a success story because authorities had been able to warn residents after monitoring picked up elevated activity. Today’s workshop will kick off a weekend reflecting on the 20th anniversary of the 1995-96 eruptions of Mt Ruapehu. This year also marks the 40th anniversary of the 1975 Ngauruhoe eruption and the 70th anniversary of the 1945 Ruapehu eruption. • The 1995-96 eruptions ejected a total of 60 million cubic metres of acidic ash – blanketing districts up to 300km from the mountain, irritating eyes and throats in the central North Island, damaging car paintwork and machinery, contaminating rivers and water supplies, ruining crops, closing state highways, forcing airports to shut and killing livestock which ate ash-covered pastures. • Electricity suppliers were hit with multimillion-dollar losses as ash shorted out power pylons and severely damaged turbines in the Rangipo power station. At times the ash plume reached as high at 10km, which represented a significant aviation hazard. • The eruptions were similar in size to those in 1945, but their social and economic impacts were much greater. In 1945 there was just one ski area and no ski lifts on Ruapehu. By 1995, there were three ski areas and 36 ski lifts. By the mid-90s there were up to 10,000 people on the mountain on some days during winter. The eruption of Ruapehu, June 1996. Just like Mt Tongariro’s surprise bang on Wednesday afternoon, what happened a few kilometres away at 8.20pm on September 25, 2007, came suddenly and violently. Shortly before airline pilots noticed a black plume rising above Mt Ruapehu, a volcanic blast threw ash, rocks and water across the summit area, sending two muddy torrents down the skifields. Inside a hut on the edge of the crater lake, William Pike and James Christie heard a “massive boom” before the building’s door was blown from its hinges and mud and rock poured inside. Mr Pike’s crushed leg later had to be amputated. The warning signs Mt Ruapehu gave in the days before that explosive moment are being seen again now – worrying scientists that the mountain could be about to produce a similar-sized eruption. GNS volcanologist Michael Rosenberg said Mt Ruapehu has been showing two forms of unrest, which are considered unrelated. There have been 45 earthquakes about 5km beneath the mountain since early August, but 35 of those have come in the past month. 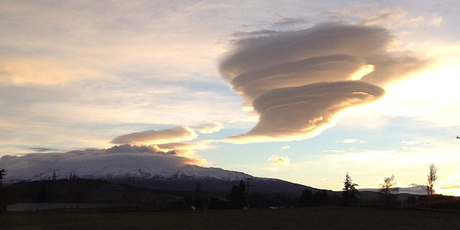 Mount Tongariro has erupted, GNS Science reports. The eruption came from Te Maari Crater, on the western side of the mountain, shortly before 1.30pm. A massive plume of ash can be seen coming from the mountain. GNS Science duty volcanologist Nico Fournier told APNZ the eruption happened about 1.20pm. Dr Fournier said the eruption was not very loud and was smaller than an earlier eruption in August. Tongariro, in the centre of the North Island, erupted in August for the first time in 115 years, sending ash as far east as Napier. According to GeoNet, Tongariro is a complex of multiple volcanic cones constructed over a period of 275,000 years. The mountain’s active vents include Te Maari, Emerald, North Crater and Red Crater. Last week GNS Science increased the likelihood of neighbouring volcano Mt Ruapehu erupting, following increased activity on the mountain. 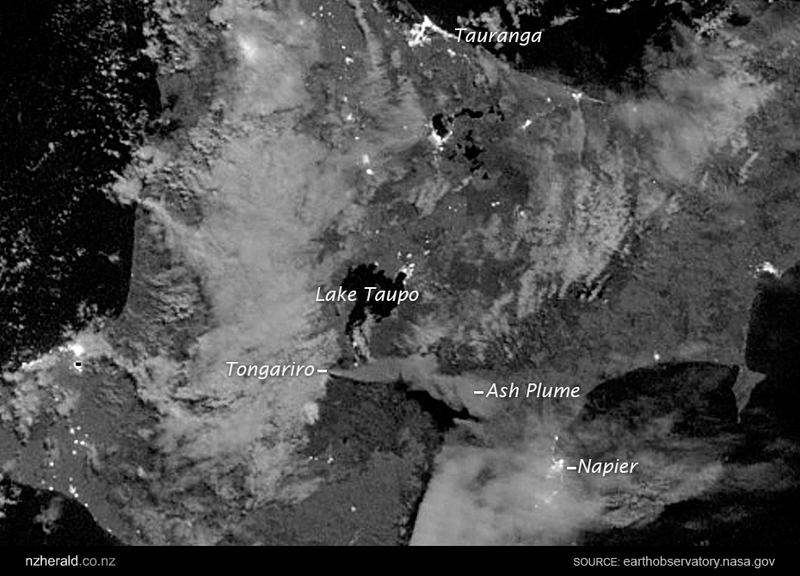 NASA has released an image of the ash plume stretching out from Mt Tongariro shortly after it erupted on Monday night. The central North Island volcano erupted at 11.50pm, the first time in more than 100 years. 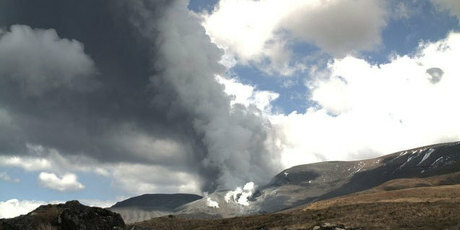 A huge ash cloud is covering the central North Island as Mt Tongariro erupts for the first time in more than a century. Roads were closed, flights disrupted and nearby residents have been advised to stay indoors as ash and rock spews from the mountain. The volcanic alert level for Mt Tongariro has risen from 1 to 2, while the aviation colour code has been raised to red.